Umbrellas left on Metro-North Railroad trains are seen in Metro-North’s lost and found department at New York’s Grand Central Terminal in 2007. My colleague Allison McCann was dozing on the New York City subway with her hands in her pockets. When the train’s opening doors woke her, she quickly registered the cellphone and keys she was grasping as she leaped off the car. The relief at catching her stop lasted for half a second; the horror of realizing she had left her bag under the seat lasted longer. Allison spent her first week working at FiveThirtyEight making daily calls to New York’s Metropolitan Transportation Authority (MTA), describing the contents of her bag and hoping, hoping, hoping that some kind soul had turned them in. 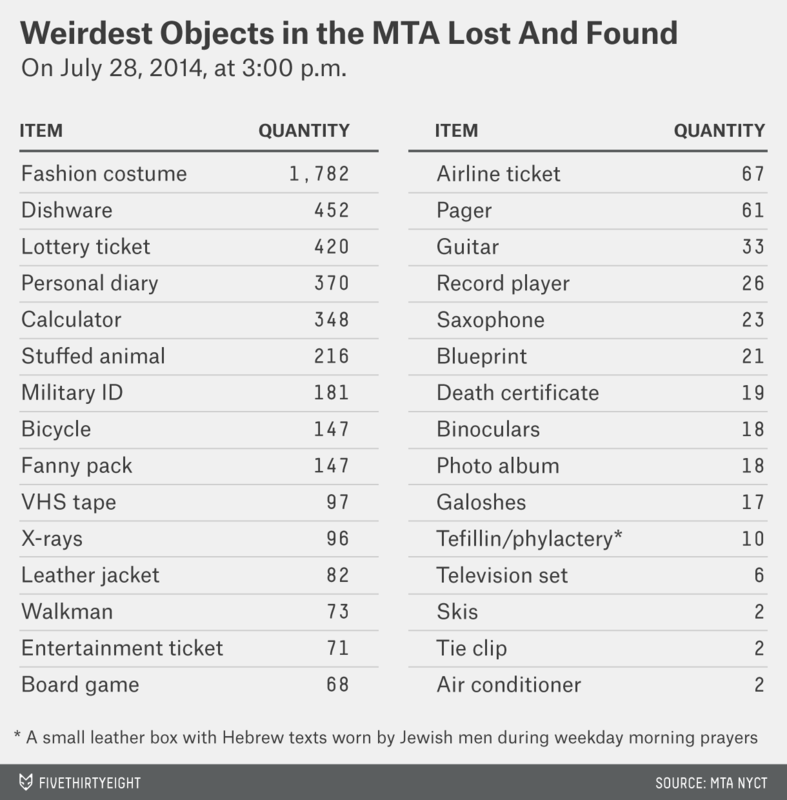 The MTA’s lost and found system is vast. It has to be — whether by bus, train or subway, millions of people travel on the network each day, and they leave a bunch of stuff behind. The MTA publishes its lost and found inventory (spotted by Tim Wallace), so we’re able to explore the items on its shelves. The data is updated hourly, so bear in mind that some of the stuffed animals mentioned in the chart below might be claimed, and some extra umbrellas might have been handed in. As of 3 p.m. Monday, there were 168,478 items in the system. 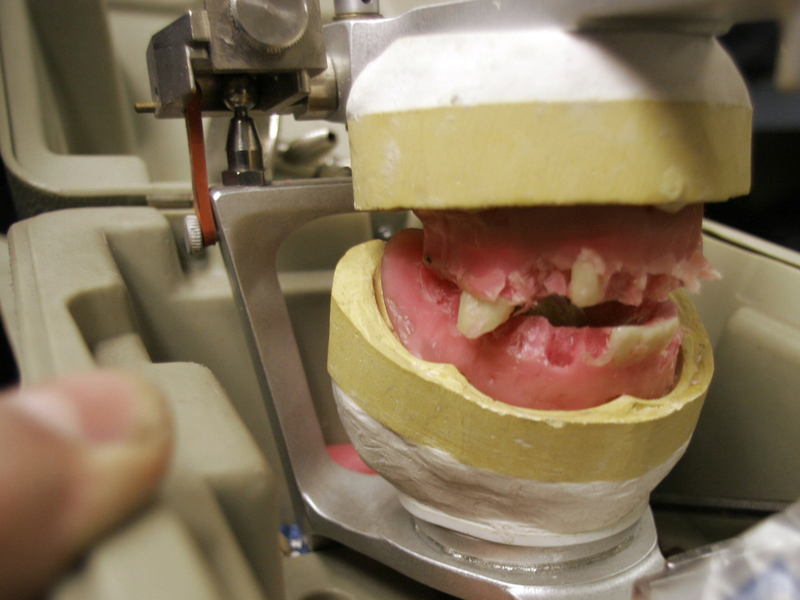 A set of incomplete dentures at the MTA’s storage area for lost items. It’s not just riders who leave the MTA system lighter than they entered; there’s a category in the lost and found data labeled “New York City Transit Equipment.” As of Monday, that category listed 306 items, including 34 badges, eight vests and seven radios. But those numbers are nothing compared with the thousands of eyeglasses, keys and shirts (hang on, shirts?!) that have a temporary home in the MTA’s lost property offices (on the mezzanine below the A, C, E lines at Penn Station). Looking at the most commonly lost items, Allison has at least one source of potential solace: She did well to hang on to her cellphone. The contents of Allison’s bag remain lost. But others who have filled out a lost property inquiry form have had better luck. About 42 percent of the items handed in to lost and found were claimed in 2013, according to Paul Fleuranges, executive director for corporate and community affairs at the MTA. As of Monday, the MTA had reunited 55,921 items with their owners — although the transit riders who left behind 1,813 “undergarments” might not be so eager to step forward.